Looking for a memorable experience? Frieda’s Teabus will not disappoint! 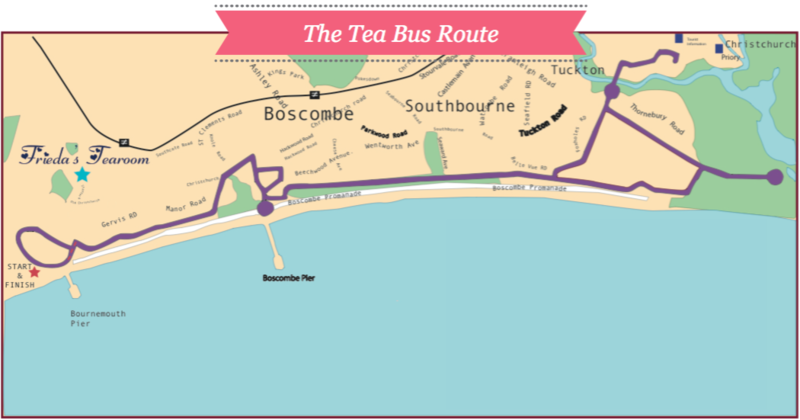 The Teabus will drive along the Bournemouth Sea Front where you can enjoy breath taking views whilst you indulge in the fabulous Frieda’s Luxury Afternoon Tea. We greet you at Bournemouth Pier and drive you to Boscombe Pier while you are enjoying tasty sandwiches and delicious cakes and pastries. You will be able to view spectacular blue ocean, whilst sipping on your hot cup of tea or preferred coffee. The journey carries on alongside the coast and we will have more stops for you to step out and inhale the ocean breeze. In the case of major events in Bournemouth, we may use a different route for the Teabus, please let us know in advance if this is not what you wish, we can then re-arrange your booking based on Teabus service availability. Frieda’s Teabus Tours depart at 2pm every Saturday and Sunday from Bournemouth Pier. If you would like to book the bus Monday to Friday, please get in touch here. Pour yourself a nice cup of tea and read Frieda’s blog!